Congrats to the 2018 College League Champions! Basketball and Cheerleading Registration is Now Open! Online registration for the 2018-19 season is now open! The CBA will be holding Travel team tryouts in late October. Assisting in running our camp will be Tom Fitzpatrick and Tom Diana. They are the well renowned directors of the All Island Basketball Camp. They will be on premises each day for both sessions. Camp Registration fee is non-refundable after July 1st, 2017. Prior to July 1st, 2017 cancellations will be accepted for medical reasons only. A written request with a physician’s letter of explanation is necessary to process any refund. There will be a $75 processing fee for any refund prior to July 1st, 2017. If an illness or injury occurs after July 1st, 2017,a prorated credit will be awarded towards registration for next year’s camp. THERE ARE NO EXCEPTIONS TO THIS POLICY. 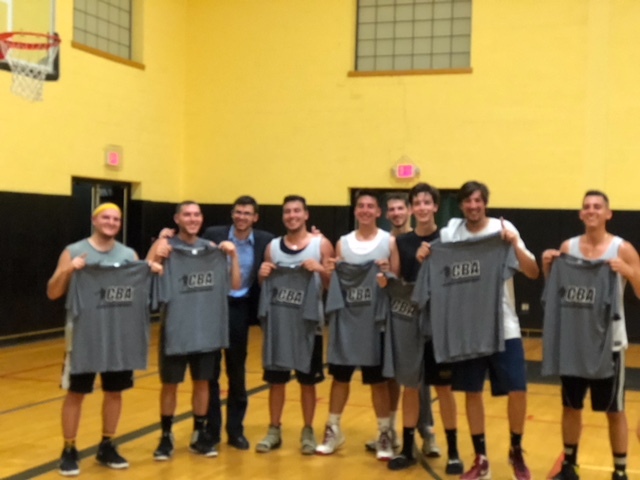 The newly formed Commack Basketball Association, is comprised of 20 of the hard working dedicated people who have helped bring the Commack and surrounding community the quality basketball and cheerleading program at the CTK/CYO over the years. Most of whom have been involved for well over a decade. Launching a new program from scratch has proven to be a large undertaking, and we have been working hard to put it all together.